This year´s Boot Duesseldorf boat show, from my point of view, didn´t really pack a punch when it comes to premiering boats and novelties. There have been some, yes, but it was certainly not a fireworks of new boats. 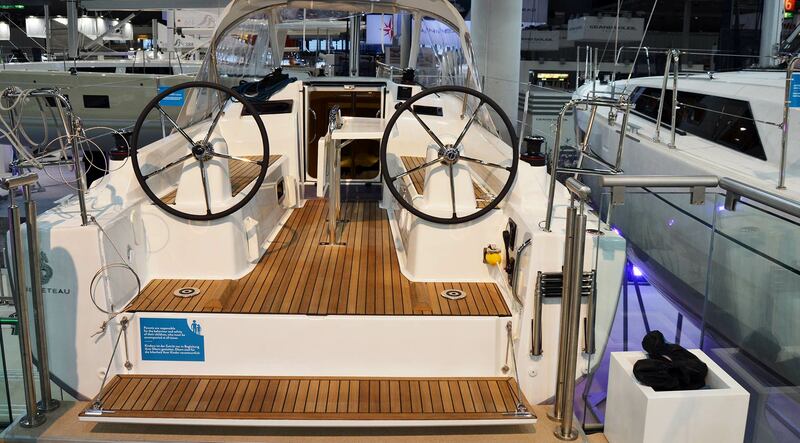 That said, except for one – and this new boat created a buzz I haven´t seen in my life before: People were standing in long queues and waiting for 20 minutes to get at least 5 minutes on the new Beneteau Oceanis 30.1. She is a damn sleek beauty indeed! The French yard kept the secret of this new boat even from the professional Beneteau dealers so that 2 days before the show opened the network announced the premiere of this new entry level yacht. The feedback was amazing: Virtually 8 out of 10 visitors on the stand wanted to see the new small-big boat. And right so they were because what Beneteau designers and the teams of Nauta and Finot-Concq have been done with this yacht is truly a Paukenschlag. What began back in 2017 with the Beneteau 51.1 with a revolutionary approach to hull design – adding chines right at the bow to increase internal volume by keeping a narrow V-shaped sleek wetted surface for superior sailing capabilities – did find the repercussions in the all-new designed Oceanis 30.1-hull. Further refined for the Oceanis 46.1 which promptly won the renown “European Yacht of the Year”-prize entered a new level in the 30.1. The chines for extra volume and a slim underwater profile. Ingenious. That said, the 9.53 metre long hull is not wider than max 2.99 metres, which – at least in Germany – is a magic number. Boats starting at 3.00 metres need a special heavy transport permission connected with extra-cost which is hefty in Germany, so, having a 2.99 m wide boat will exempt owners from these costs. By the way, no other major brand offers a slim boat like this in the 30 feet range. 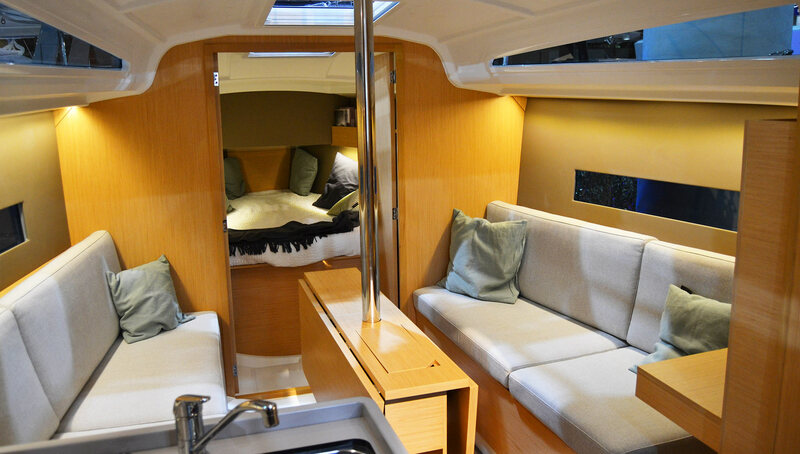 And believe me, the room that is made inside is amazing for a boat that small in overall size. The name Oceanis stands for the most successful range of ocean cruisers of all time: No other brand has more units sold and more miles sailed than Beneteau´s Oceanis range. In this, the heritage and the value that comes with this name can be a burden, but the new small Oceanis is mastering it with clear bravery. The boat is a true full-fledged cruiser for a couple or a small family indeed. Folding bathing platform, two wheels (whoever this needs). Nice. Entering the boat from the stern the owner and the guests are greeted by a large cockpit with two seating banks. In the standard version the boat comes with a tiller but can also be equipped with two wheels. There is also a folding table which I guess won´t be there when the boat is steered with tiller. A tribute to the small size of the boat is the positioning of the working winches which are returning back to the coach roof next to the entryway-entrance and the plotter/compass, which are mounted to the superstructure. The rest is pretty up-to-date. But the real “Wow” is down below. The boat is bristling with internal volume. As a two cabin boat there is a huge – and I mean really huge – aft locker in which a folding bike or even a baby Orca will find enough space. That said, the salon one enters under deck is absolutely amazing. Nauta Design has again done a great job in transferring the modern look and feel of the current seventh Oceanis generation that was so well received in the 51.1 and 46.1 to the small sister. A feeling of Wow on this 9.53 m boat. The salon is light suffused which is mainly due to the two big hull windows, large coachroof-windows and two skylights in the roof. The forward bulkhead opens with two doors so that the visual feeling of space and light is even more intense. The pretty lightness of the brushed Oak (although me personally … I am fed up with seeing Oak in almost every boat these days) is boosted by the fresh colours of the wall panels (LINK). Small workstation to starboard side, large galley. 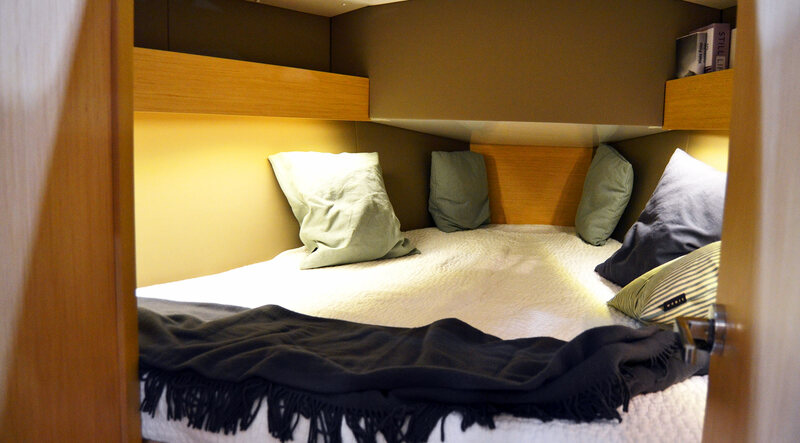 Two over 2.10 metre long settees facing each other can serve as full crew bunks as well, a folding dining table is big enough to have a big dinner served to four people. A small chart table may be folding down facing rear at the bathroom wall, when stowed away the bunk is even longer. Under the settees is loads of stowage as well. 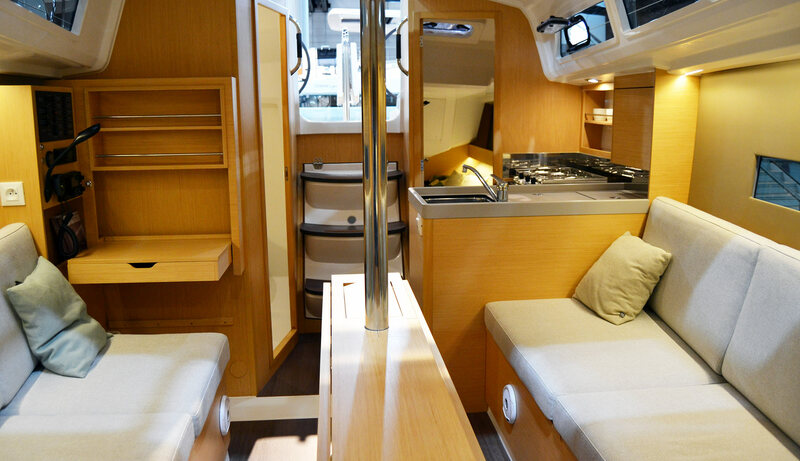 Talking of “huge” thinks, the galley in the Oceanis 30.1 may be the biggest in her class. Remembering the small sized galley of the First 30 this thing is huge: A voluminous fridge, well-sized sink and stowage for stuff. Well done! Very large galley indeed, concerning the small size of the boat. The feeling inside of the boat is fantastic. She has a CE category B certification and in this she will certainly suit sailing freshmen perfectly who are gaining their first coastal sailing experience on a full fledged yacht – this isn´t a boat, it´s a yacht indeed. And this also means comfort in every sense of the word. The boat offers a standing height of 1.97 metres in the rear part of the salon and still some 1.87 metres in the fore cabin. This, of course, is as well achieved by skipping floorboards for both the fore and the aft cabin. Which I personally do not find very much tragic because you simply do not need them: People will only enter the cabins to get into or out of their bunks. 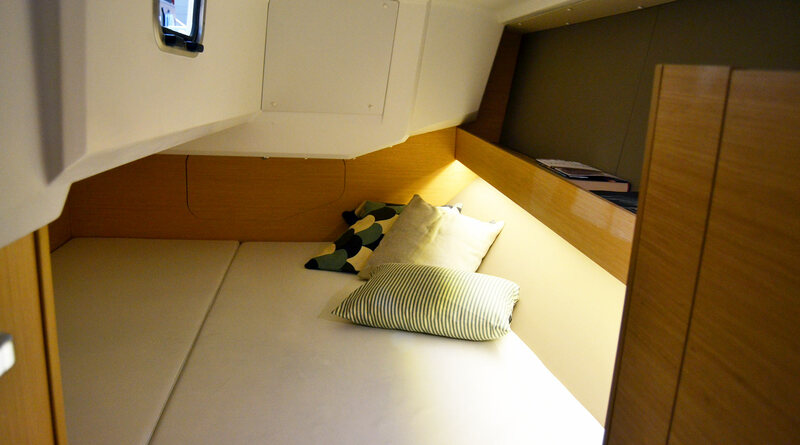 The aft cabin has a small portlight opening to the cockpit and offers far more space to find a good night´s sleep. I liked the level of craftsmanship: Even though Beneteau is a production boat company specialized in offering good priced boats with a decent quality, I was surprised to find even here the bare GRP-parts covered with wooden and coloured panels. Well done indeed! The bathroom is huge for a boat that size! 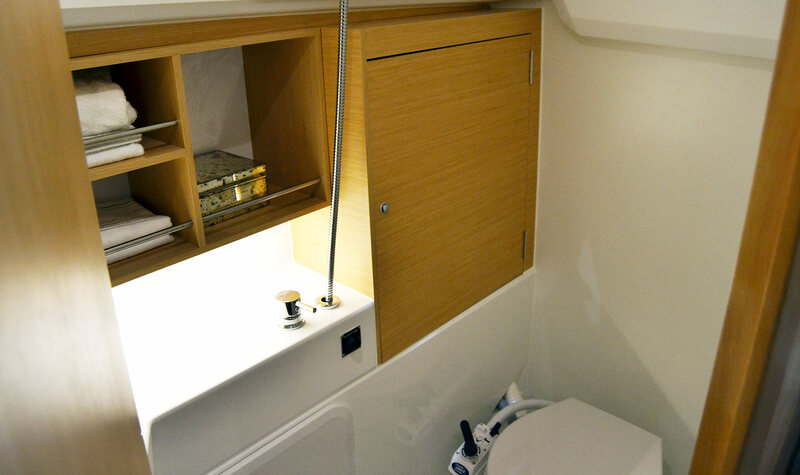 Another highlight is the bathroom which is – again – amazingly big for a boat of under 10 metres in length. The toilet is mounted facing the direction of sailing, which will at least for me be a new experience since most toilets on boats I sailed on had been mounted sideways. 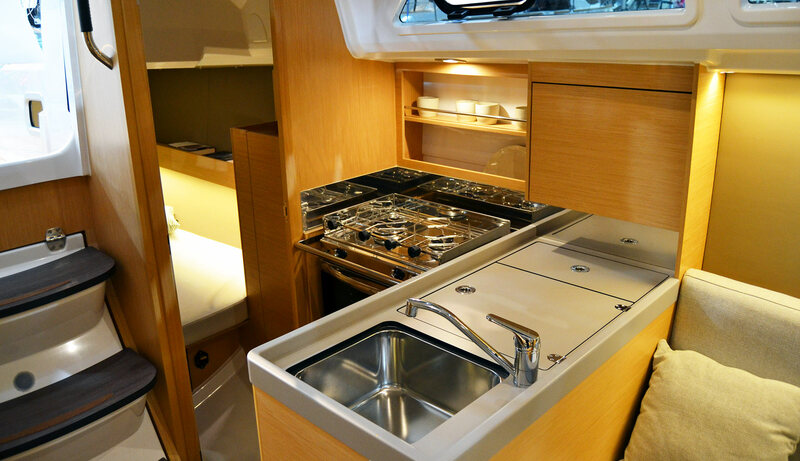 A small tap and some decently sized space for showering completes the very positive feeling about the boat´s interior concept. Where is the catch in it? Okay, so where is the catch? The price? Can´t be – according to the yard the boat is starting at 70.000 Euros ex-VAT and will be worth some 90.000 Euros ready for sailing. There will be no less than 4 variants of keels available: Two fixed keels, one swing keel and one centerboard-version that can fall dry. Sailing power? Plenty! Even in the standard version the boat´s mainsail is a square top and a self tacking job. The boat can be equipped with a large overlapping Genoa, a furling Code 0 and asymmetric Spinnaker. Excited to see her sailing! And here´s the downside: Up to this point there´s no official information on the standard equipment and packages and no price list available. First serial production units will leave the yard very late in the season, rumours say October or November 2019. That´s no Oceanis 30.1 sailing this season. On the other hand: Lots of pleasant anticipation for the owners in being for sure! In the end I was astonished by this small boat. Not only did Beneteau make it to punch through this project in complete secrecy of nine months development time, they also managed to deliver one of the biggest booms of this year´s Boot Duesseldorf with their smallest boat in the range. Chapeau, Beneteau! We will all be keenly looking onto the first sea trials and seeing this beauty under canvas.